What will the Drought Do To The California Real Estate Market? USA Today, states that California is in its third year of intense drought conditions. That article was 9-3-2014. And it is summer, June 10, 2015 today. The country is in its sixteenth year of drought conditions and it’s not looking good…the details in the article by Doyle Rice, of why? is concerning. Doyle describes a ‘Megadrought” in the article, we have a long way before that is the situation. Right now 58% of our state is declared as in a drought. Real estate this summer is, again climbing in price, as the average price range is still in the mid 500k. Prices are up, yes, but inventory is low. What is wrong with this? Well the number of homes on the market has dropped lower, Affordable properties are harder to find, cash buyers are coming out of the wood works, and short sales are rising. This all calculates to crazing California housing market. I believe it will last until people realize that the drought is only going to get worse, not better. People are holding on to their homes longer, knowing their homes will be worth more if they wait to sell. Which, means new buyers have fewer options. It’s the perfect sellers market, making it very difficult for buyers in the 300-400k to find a home. Best case is to find a nice town home/condo and sit on it until the market comes back down, or slows down and allow your income to gain over the next five years or so until you can match the price of homes in SoCal. Now, I still believe that the drought is going to cause a portion of the home owners to leave, because: 1) retirees, can live anywhere, why live in the intense heat when you can move to Oregon or Washington (hint, hint). They’re is a drought there as well. 2) Property is cheap. For $350k you can own acres in our on the outside of Eugene. Or Portland, Salam, Bend (the jewel written as one of the best places in US to live). The property will only go up in those areas because more people will be moving out of California in the coming years. People want homes to raise their children, land to explore in. WASHINGTON (January 29, 2013) – Homeowners and those looking to list their homes this spring and want the most return on their investment when it comes to remodeling should consider exterior replacement projects. According to the 2013 Remodeling Cost vs. Value Report, Realtors® rated exterior projects among the most valuable home improvement projects. Housing prices are growing stronger, showing their largest yearly gain in nearly two and a half years, according to Clear Capital’s Home Data Index Market Report, which covers housing data through December 2012. Year to year home prices gained 4.9 percent nationwide, according to the report. 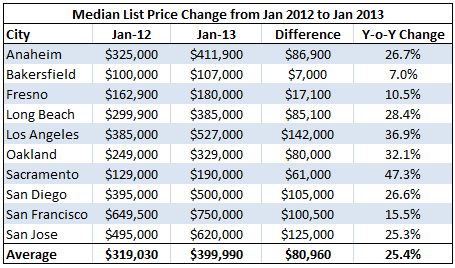 For 2013, home prices are forecasted to increase by 2.1 percent. Americans are starting to buy homes again! Realtor Magazine states that the housing market is steadily picking up in price and building. This will lead to more jobs in the housing industry thus boosting the economy.